Fairy tales do come true at Lyndhurst. Unforgettable, magical moments can be yours once you enter the gates of our estate. Whether you step out of the grand double-castle doors and descend onto the Great Lawn to exchange your once-in-a-lifetime vows, or your ceremony takes place at the height of our rose season, or you host an intimate wedding amidst the historical magnificence of the mansion, the biggest and best day of your life will be as special and significant as you are. The options are limitless and our property will be all yours for a day. 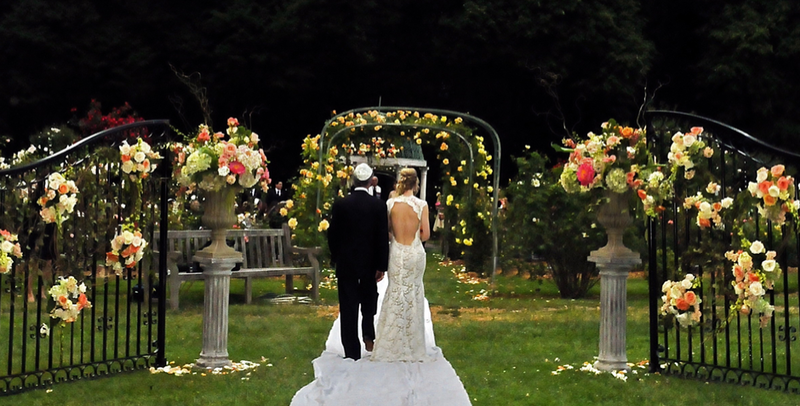 Lyndhurst is the ideal venue for dramatic, fairy tale weddings large or small. From the moment your guests enter the estate they will be immersed in the beauty, history and solitude of Lyndhurst, which is set on sixty-seven acres on the widest part of the Hudson River, only thirty-five minutes from New York City and easily accessible from multiple transportation hubs. Whether your wedding is elegant and formal, or simple and rustic, Lyndhurst will make you feel like true royalty in our unique castle setting with the Mansion as your backdrop and a variety of flexible, customizable event spaces and tenting areas. Our Carriage House is home to Lyndhurst’s semi-permanent tent, which hosts up to 300 guests with dinner and dancing. While this is our most traditional and commonly-used reception space, other opportunities for tented receptions exist throughout the property. Ceremonies can be held on the Great Lawn or in the Rose Garden. The Mansion serves as the backdrop for your event, and makes every moment more-than-picture perfect. Intimate weddings, for up to 80 guests, can be held within the Mansion. CulinArt Group Catering Collection presents Lyndhurst’s exclusive trio of catering brands, Philip Stone Caterers, Robbins Wolfe Eventeurs and Regal Glatt Kosher Caterers (certified Kof-K). Our domestic and international catering expertise presents expert menus ranging from contemporary American to South Asian cuisine, and everything in between. And, quite unique, Lyndhurst is a pet-friendly estate. Our minds and hearts are open to weddings of all types and origins. It is our goal to open the doors to our estate and let you live, dine and celebrate like royalty for your most important day.